What do the Arab Spring, the Robin Hood legend, Occupy Wall Street, and the American taxpayer reaction to the $182 billion bailout of AIG have in common? All are rooted in a deeply ingrained sense of fairness. But where does this universal instinct come from? This is the driving question at the heart of L. Sun’s The Fairness Instinct. 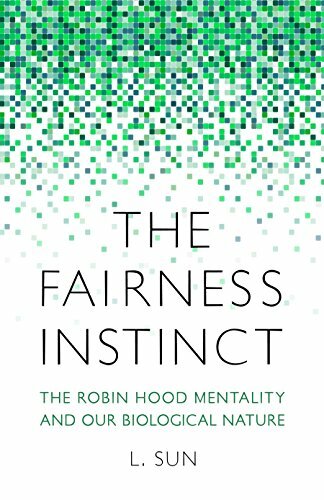 Thinkers from Aristotle to Kant, from Augustine to John Rawls, and religions from Christianity to Confucianism, have offered great insight into the nature and origins of this basic human desire for fairness. Based on the most recent scientific discoveries in behavioral genetics, neuroscience, psychology, anthropology, economics, and evolution, Sun argues that the origins of the fairness instinct cannot be found exclusively in the philosophical, social, and political perspectives to which we so often turn; rather, they can be traced to something much deeper in our biological makeup. Taking as his starting point Frans De Waal’s seminal study showing that Capuchin monkeys revolt when they are shortchanged by receiving a less valuable reward than their peers receive for the same task, Sun synthesizes a wide range of research to explore the biological roots of the fairness instinct. He shows that fairness is much more than a moral value or ideological construct; fairness is in our DNA. Combining scientific rigor with accessible and reader-friendly language to relate fascinating stories of animal and human behavior, The Fairness Instinct lays out an evolutionary roadmap for how fairness emerges and thrives under natural selection and how two powerful engines—social living and social hierarchy—have fueled the evolution of this intricate and potent instinct in all of us. Probing into the motives that underlie such phenomena as envy, consumerism, anti-intellectualism, revenge, revolution, terrorism, marriage, democracy, and religion, Sun showcases the power of the fairness instinct to make our history, shape our society, and rule our social lives.